1) Reverse-Engineered Ponzu Roasted Brussels Sprouts a la Namu: I love trying to copy a dish from a fancy restaurant. 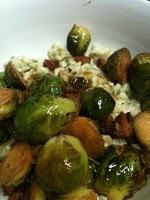 The brussels sprouts served at the Foodbuzz awards dinner were delicious, and surprisingly easy to make at home. 2) The Best of the Foodbuzz Blogger Festival: Number two in this list of the top 10 things we've blogged this year is a list of the top 10 things we blogged at the fantastic Foodbuzz food blogger festival. 3) We're On Twitter! : We may not be Ashton Kutcher - and I'm not sure I would ever want to be - but we're getting there. 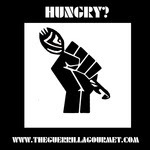 Checkout @guerrillatogo and follow us! 4) SF Food Bank's Hunger Challenge: This project was an eye-opener, but not in the way we thought. Living on a budget of $4 per person, per day wasn't too hard - as long as you have a KitchenAid and plenty of time on your hands. Desperate Housewives and a Posh Pig-Out after the jump! 5) Desparate Pasta: Guerrilla Cooking blends flexibility, improvisation and tradition. This recipe that Tiffany Discovered encapsulates those principles. 6) Some Hyper-Local Dining: We grew mushrooms! In our garage! Food doesn't get more local than that. 8) The Not-So-Great American Food Festival: It was great to see Bobby Flay and Anne Burrell in real life, but waiting more than an hour with a bunch of mean-spirited drunks for a wanly greasy Philly cheesesteak was no fun. But my biggest regret was not taking the chance to hang out with Nate Appleman who signed maybe two books in an hour (while the line for Boby Flay snaked halfway through the amphitheater). 10) A Bourgeoning Love Affair with Hunan Food: Since I discovered Fuschia Dunlop's books, my idea of Chinese food has never been the same. The eggplant pot in this post is part of our regular repertoire, as are several other inexpensive and humble yet delicious and fortifying dishes from Hunan and Sichuan.